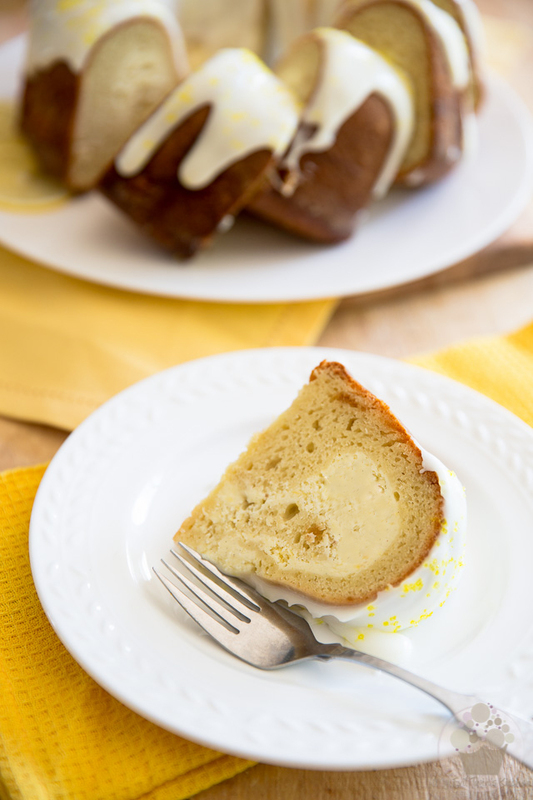 Dense and compact but so very tangy and refreshingly tasty, you’ll want some of that Lemon Cream Cheese Bundt Cake even in the middle of summer! 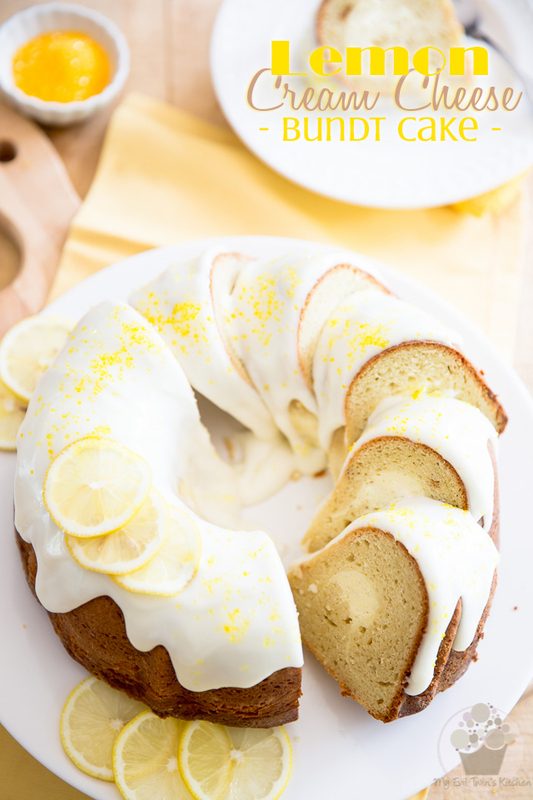 But you see, the thing with this Lemon Cream Cheese Bundt Cake though is even if it will have you use the oven right in the middle of summer, you will totally forgive it just as soon as you sink your teeth into your first bite. 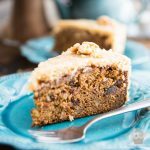 Oddly enough, this is the type of cake that you’d probably normally reserve for the colder winter months, seeing as how it’s sort of dense and heavy, what with the addition of cream cheese to the batter and all. But then its creamy, cheesy center, as well as its tangy and refreshing lemony flavor make you want to go back for more. 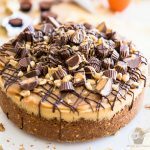 If like me you’re a real fan of super dense and heavy cakes, then you will be all over this one: since cream cheese gets added to it not only in the form of a creamy filling, but also as an actual part of the batter, it does make for a very compact, almost chewy cake, especially when it comes right out of the fridge. And if really you feel that it’s way too hot to get the oven going right now, you could very well save the recipe and make it later, you know. Once again, I’ve prepared a little bit of a visual guide for those of you who are like me and like to have everything ready before they start. 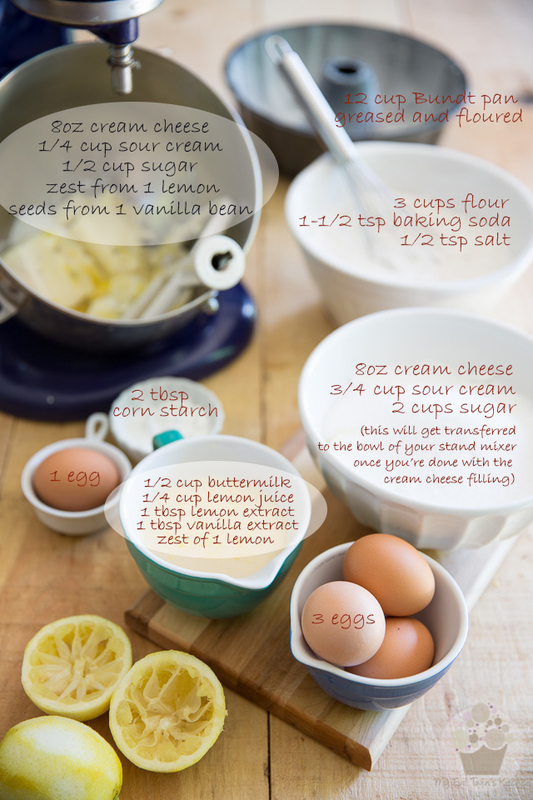 In the bowl of your stand mixer equipped with the paddle attachment, combine the cream cheese, sour cream, granulated sugar, lemon zest and vanilla seeds. If you didn’t have any fresh vanilla beans, you could very well use extract here. I like to use the beans because I’m a huge fan of the hundreds of minuscule black seeds that they add to the filling, not to mention their amazing flavor! But like I said, if you don’t have a fresh bean handy, don’t sweat it. You can totally reach for the extract this time; The vanilla police ain’t gonna come looking for you! Beat the ingredients on high speed until smooth and well combined; stop the motor to scrape down the sides of the bowl as needed. 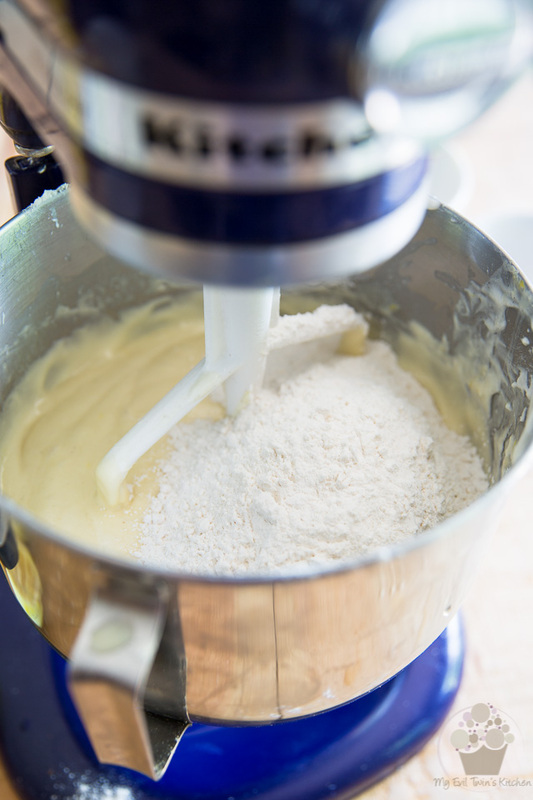 …then throw in the corn starch and give the mixture a final beating, until well combined. Transfer this mixture to a bowl and reserve. 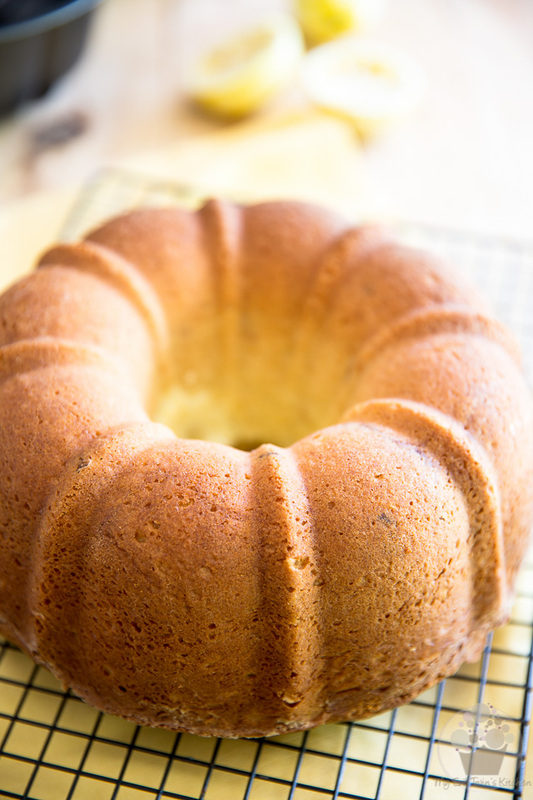 If you haven’t done that already, (if you’re the type who prefers to do things as they go) preheat your oven to 350°F, grease and flour a 12 cup Bundt cake pan and set it aside. 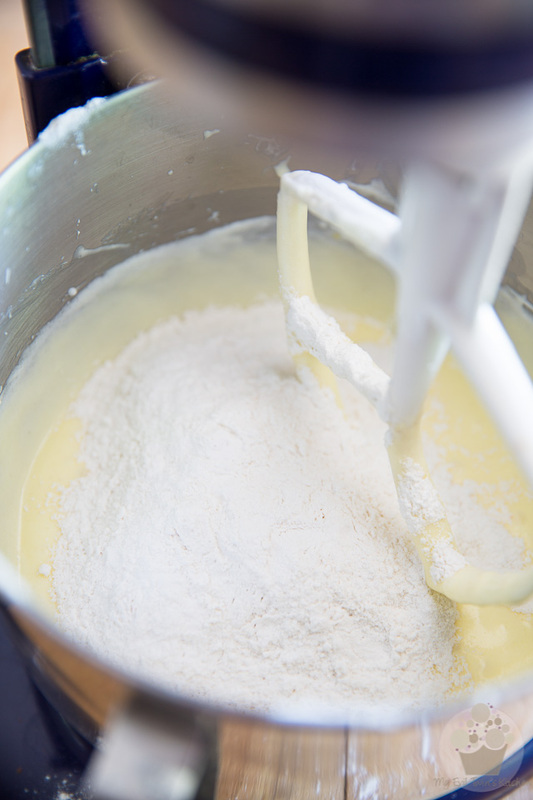 Then, in a large mixing bowl, whisk the flour, baking soda and salt together. 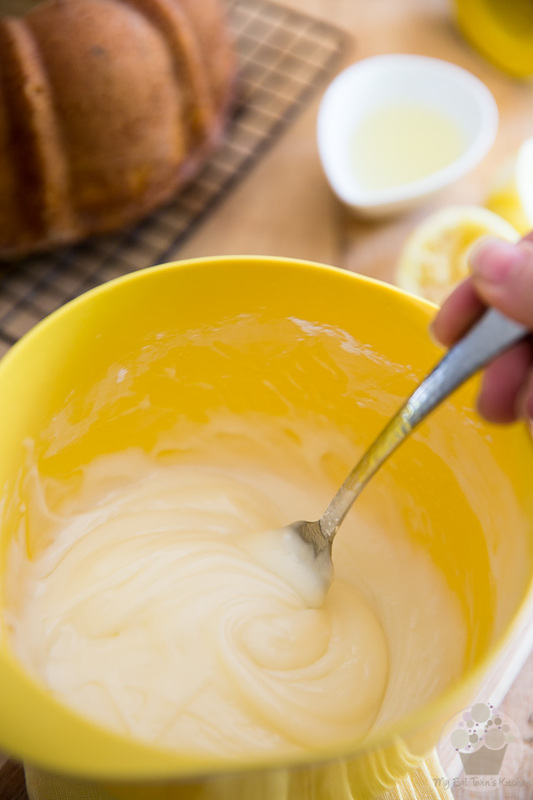 In yet another bowl, or measuring cup, combine the buttermilk, lemon juice, lemon extract, vanilla extract and lemon zest. 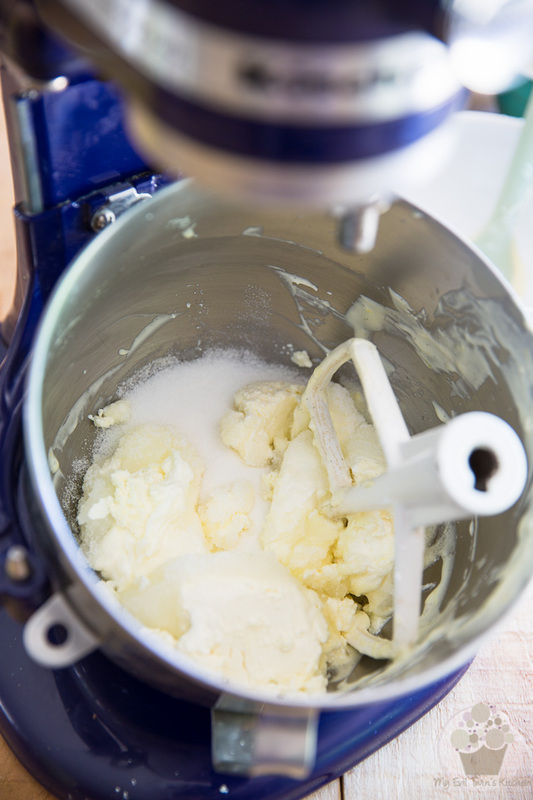 Now in the bowl of your stand mixer, (told you we were gonna use it in a minute) still equipped with that same paddle attachment, combine the cream cheese, sour cream and granulated sugar. Beat on high speed until well combined and creamy. Add the eggs, all 3 of them, and beat until fully incorporated. Mix on low speed until the flour is just incorporated, no more. 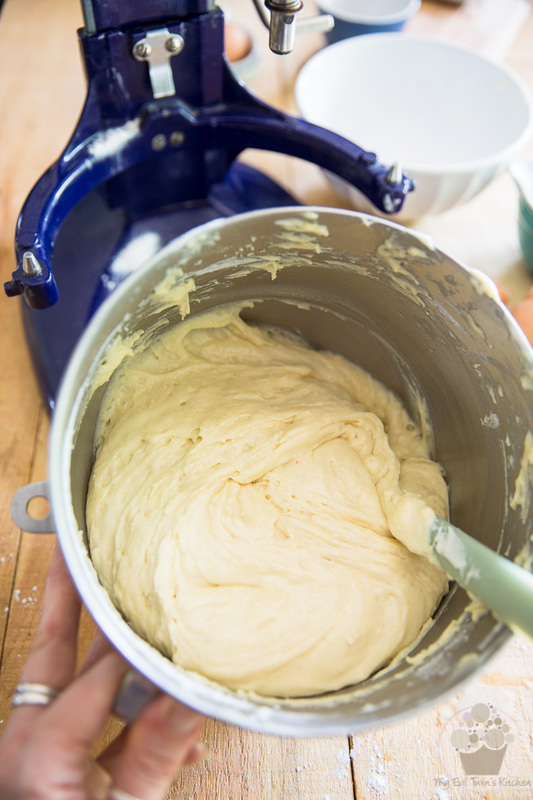 Scrape the sides of the bowl with a rubber spatula to finish incorporating the flour, if you have to. 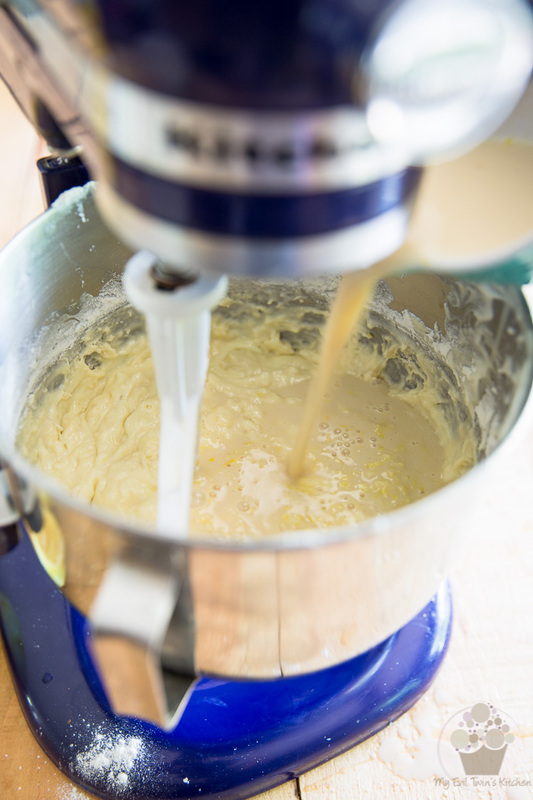 Now pour a little more than half the batter into the prepared pan; with your rubber spatula, try and get a little bit of the batter up to the sides of the pan, to create a some sort of a shallow bed for the cheese mixture. 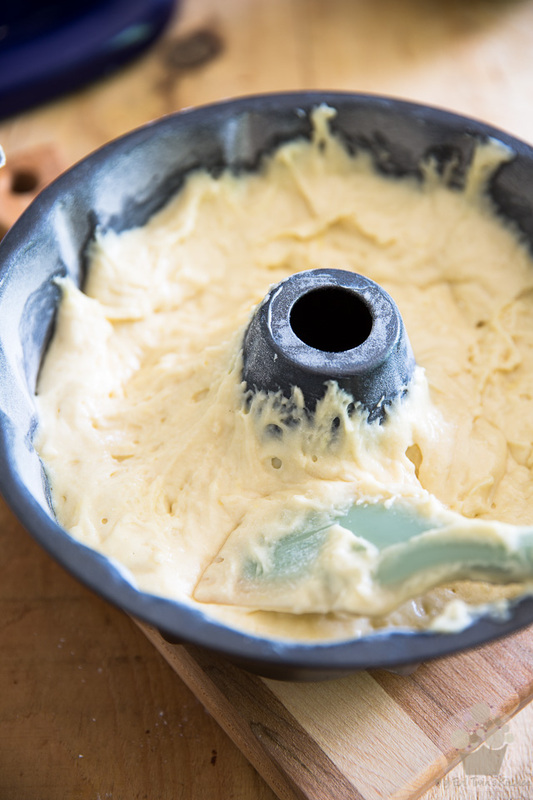 Spoon the reserved cream cheese mixture over the cake batter, trying your best to prevent it from touching the edges of the pan. 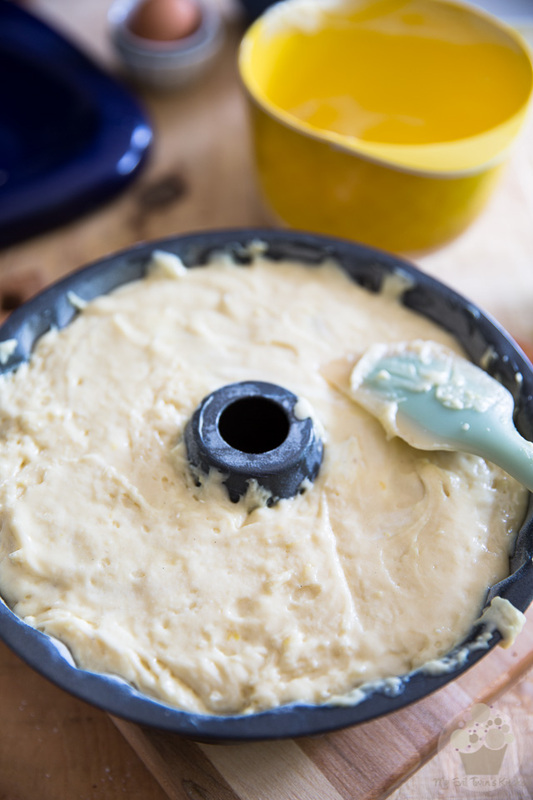 Top the cheese filling with the remaining cake batter and spread delicately to smooth the top. Be very gentle when you do this: that cheese filling is very soft and will most probably try and find its way to the top of the cake. 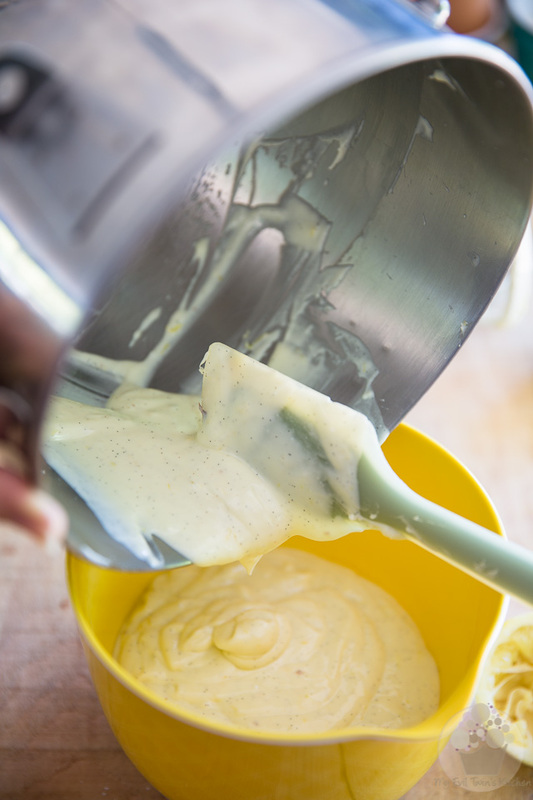 Drop the batter by the spoonful over the filling and then spread it very delicately with your spatula. Bake the cake for 50 to 55 minutes or until a toothpick inserted into the center of the cake comes out clean. 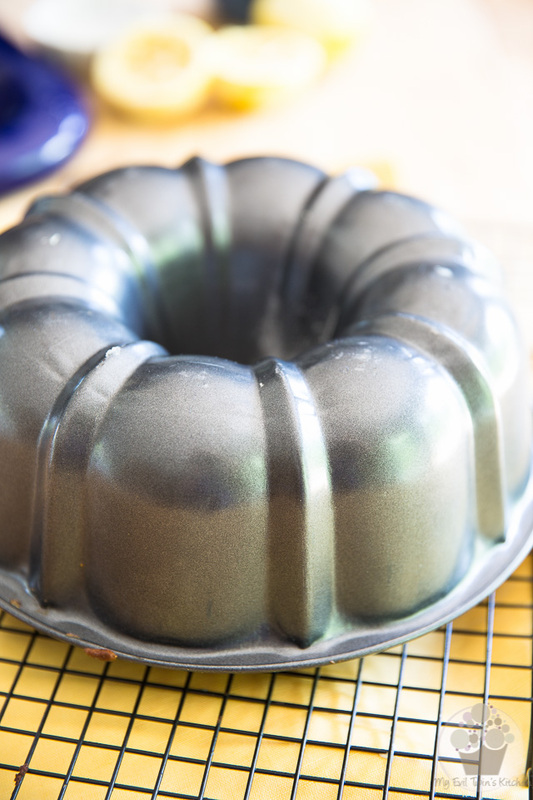 After 30 minutes, cover the cake loosely with aluminium foil to prevent burning. 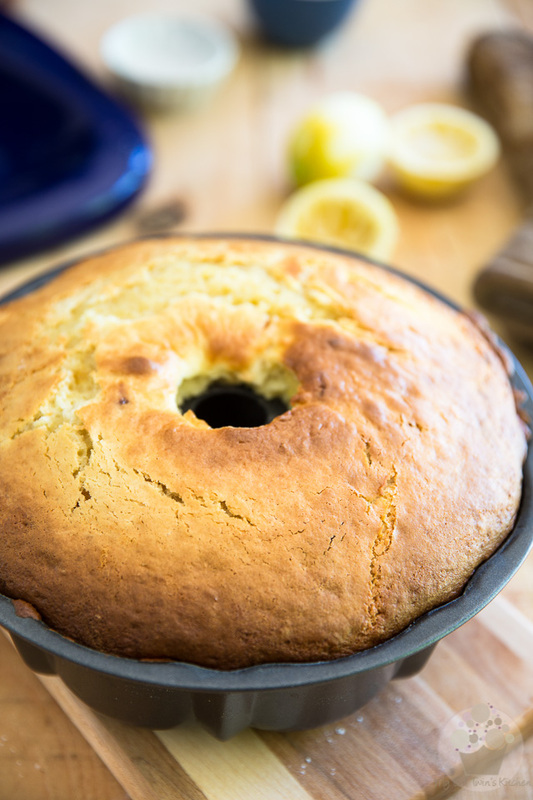 When the cake is ready, remove it from the oven and place it on a cooling rack. Let the cake cool in the pan for 10-15 minutes, then very delicately remove it from the pan and let it cool to room temperature. Transfer the cake to the refrigerator and let it chill completely, about 2 hours. In a small mixing bowl, combine the sour cream and powdered sugar and mix with a fork until well combined. 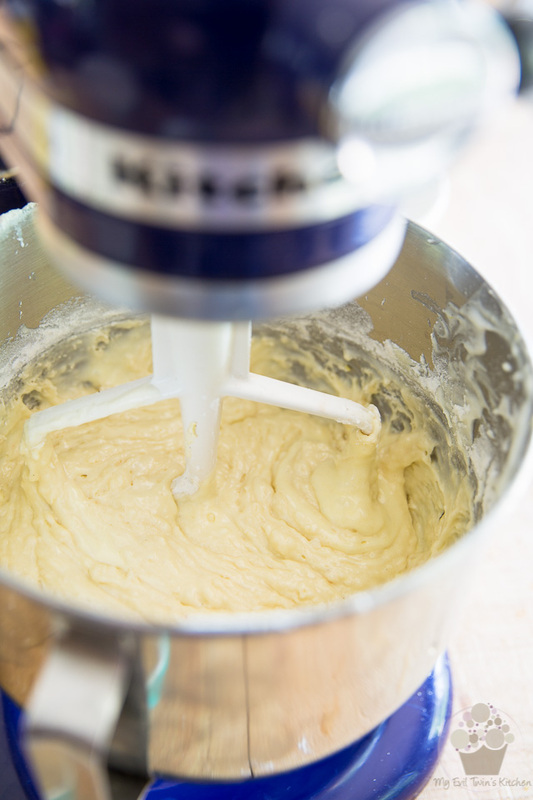 In this next step, we’re going to add liquid to our icing to give it the desired flavor and consistency. It’s important that you add very little liquid at a time here, otherwise your icing could turn super thin on you. Trust me, that happens fast! 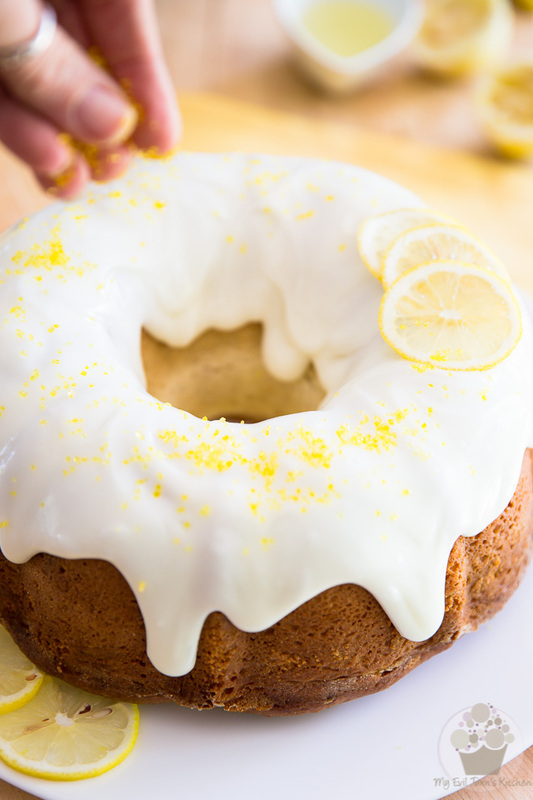 Also, depending on how strong a lemon flavor you want your icing to have, you can use lemon juice or lemon extract, or even a little bit of both. 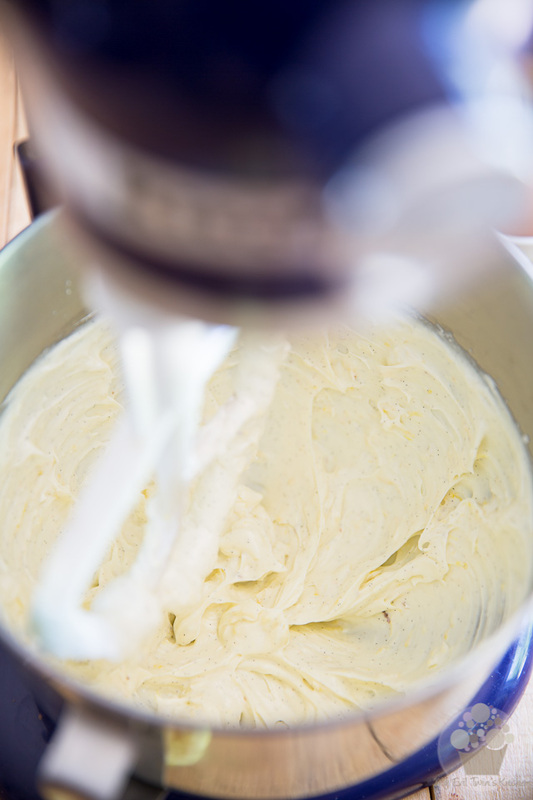 So add that lemon extract or juice to your icing, about 1/4 teaspoon at a time, until the desired consistency is achieved. You’re looking for a thick, sticky and semi-pourable icing. When the cake is completely chilled, spoon the icing over the top of the cake. It’s important to wait until your cake is chilled, otherwise the heat from the cake would kind of “melt” the icing. 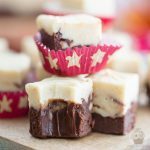 This would make the icing really thin, ruining all the efforts that you’ve just made to get it to just the right consistency. 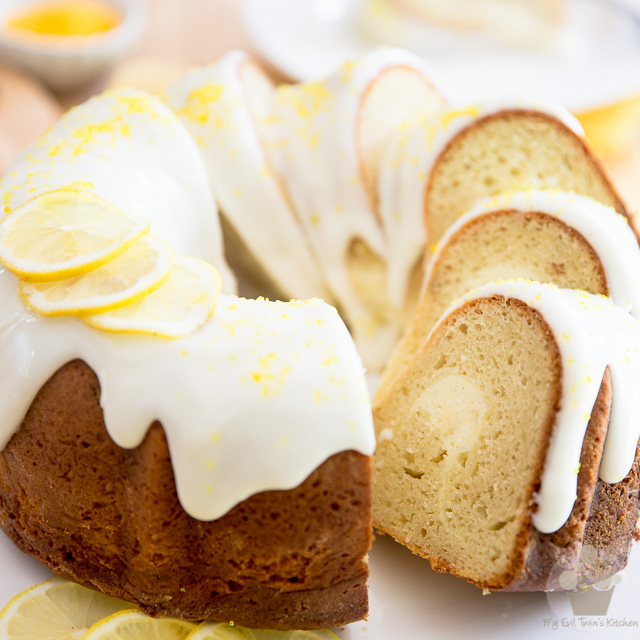 Now all that’s left to do is garnish your cake with a few slices of lemon and yellow decorating sugar, if your heart feels like it. Your cake can now be sliced and served! No need to wait any longer. 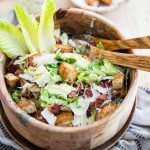 Any leftovers you’ll want to keep in the fridge in an airtight container for up to a week. However, I strongly recommend that you leave your slices at room temperature for about an hour before you indulge. Straight from the fridge, this cake tends to be a little bit on the firm side. If you’re a fan, though, by all means, go straight to town! That, or if you didn’t have that kind of patience… which I totally couldn’t blame you for! 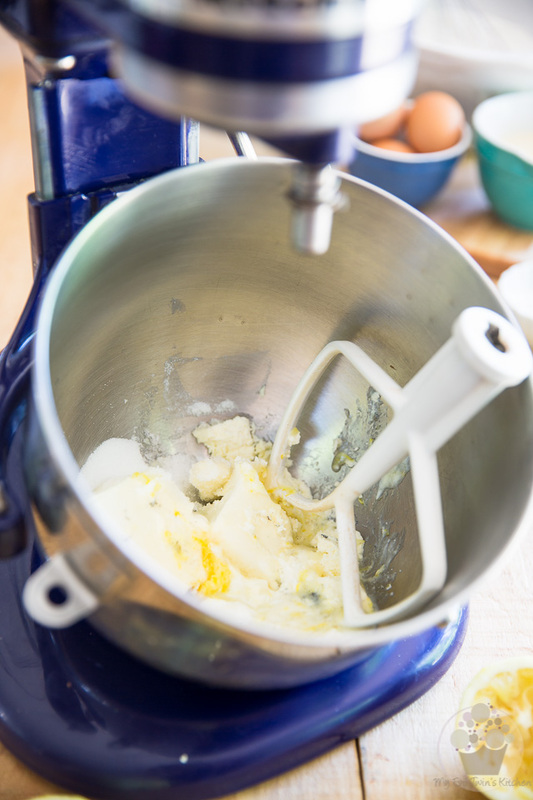 In the bowl of your stand mixer equipped with the paddle attachment, combine the cream cheese, sour cream, granulated sugar, lemon zest and vanilla seeds and beat on high speed until smooth and well combined; scrape down the sides of the bowl as needed. 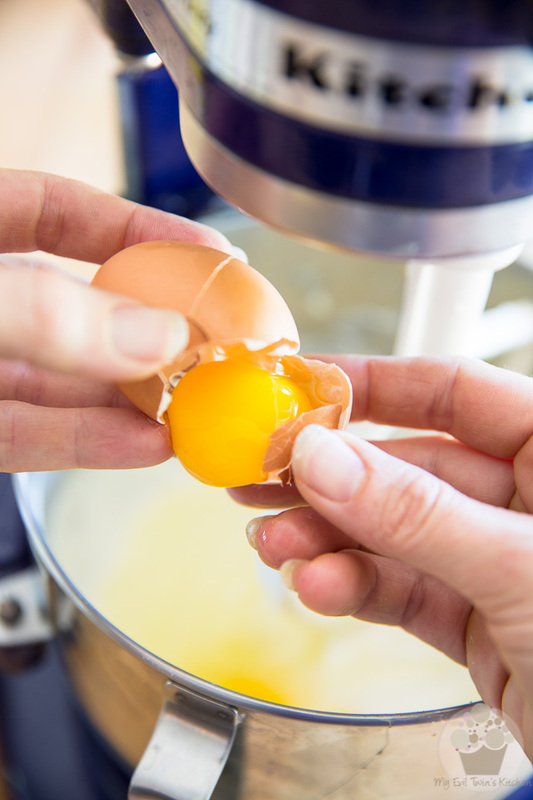 Add the egg and beat until it's completely incorporated, then throw in the corn starch and give the mixture a final beating, until well combined. Transfer to a bowl and reserve. Preheat the oven to 350°F. Grease and flour a 12 cup Bundt cake pan and set aside. 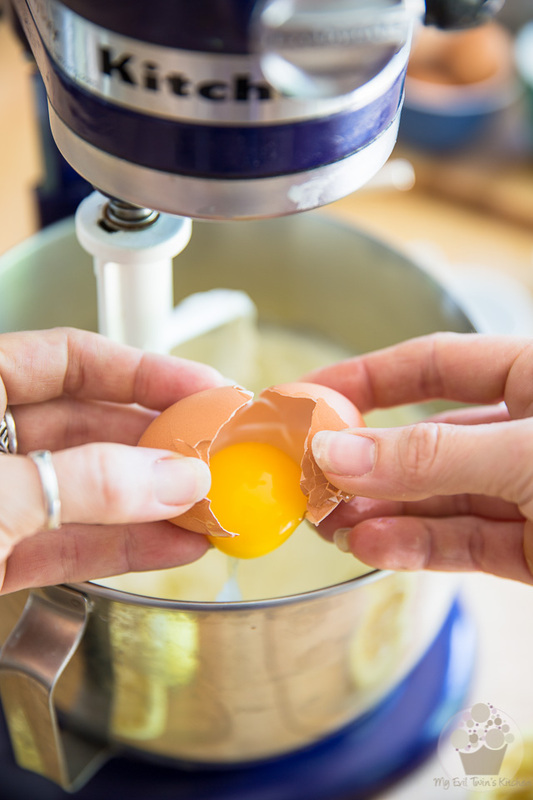 In a large mixing bowl, whisk the flour, baking soda and salt together. Set aside. 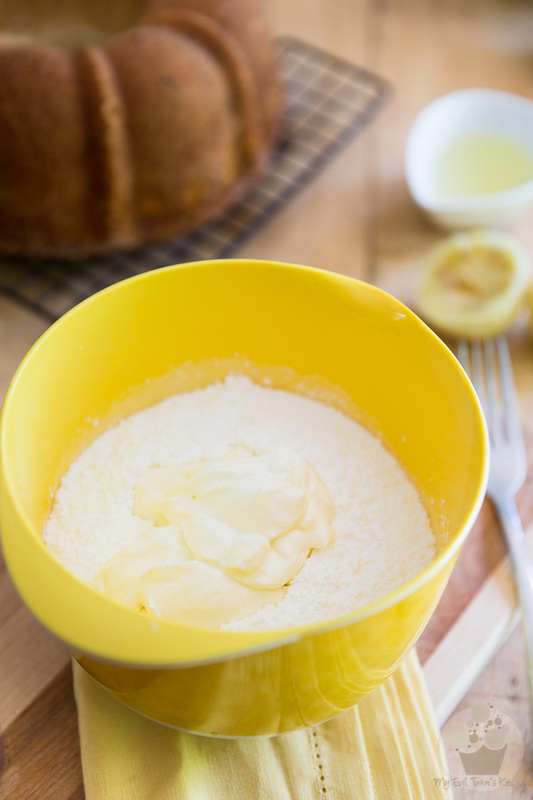 In a separate bowl or measuring cup, combine the buttermilk, lemon juice, lemon extract, vanilla extract and lemon zest. Mix well and reserve. 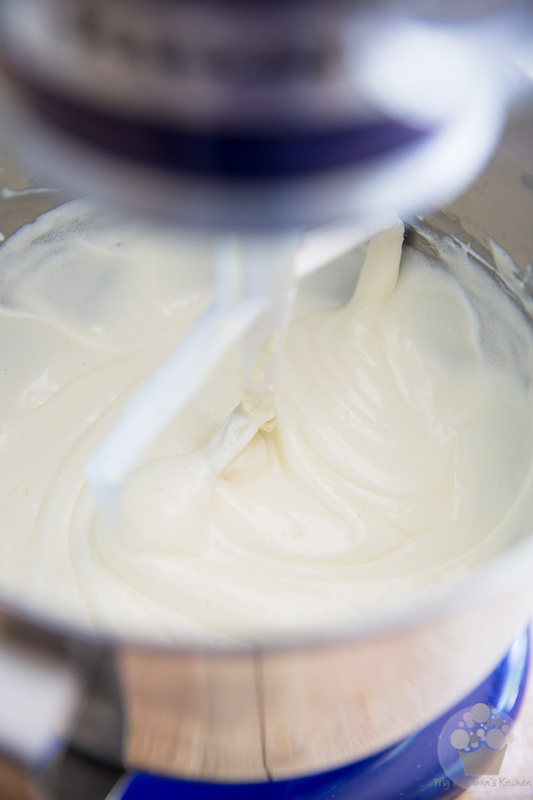 In the bowl of your stand mixer, still equipped with that same paddle attachment (no need to rinse anything) beat the cream cheese, sour cream and granulated sugar on high speed until well combined and creamy. Again, scrape the sides of the bowl as needed. Add the eggs and beat until fully incorporated. 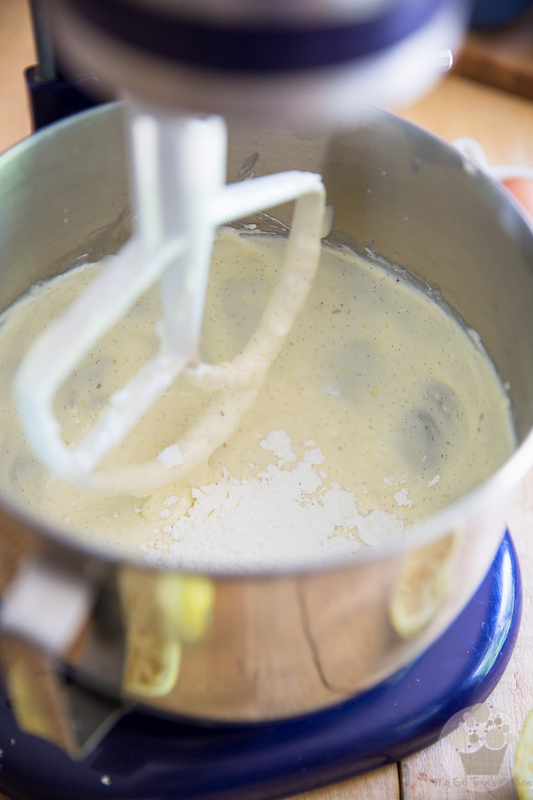 Next, add half the flour mixture to the bowl and mix very delicately, until just incorporated; pour in all of the buttermilk mixture, beat until well blended and then finally, add the rest of the flour mixture and mix until just incorporated, no more. 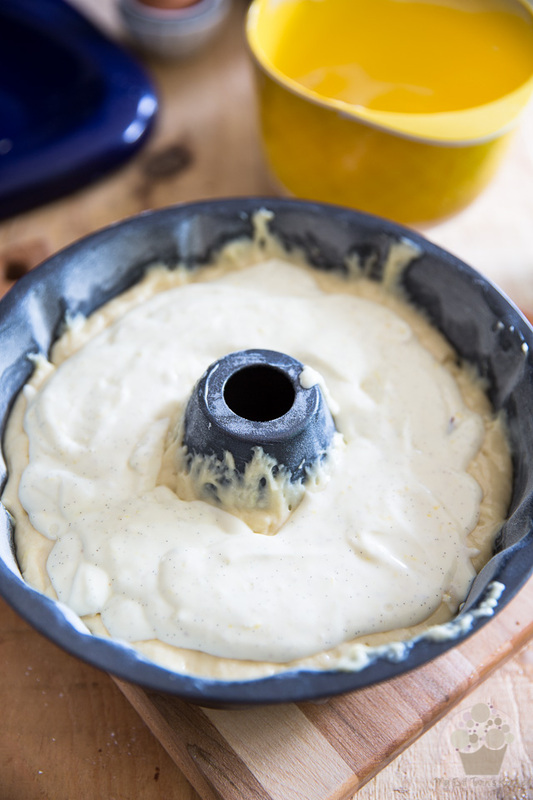 Pour a little more than half the batter into the prepared pan; with your rubber spatula, try and get a little bit of the batter up to the sides of the pan, to create a some sort of a bed for the cheese mixture. 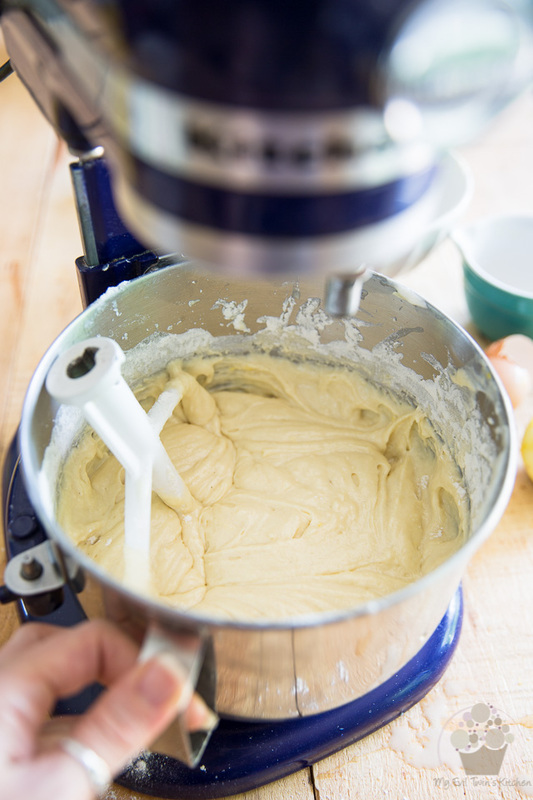 Spoon the reserved cream cheese mixture over the cake batter, trying your best to prevent it from touching the edges of the pan. 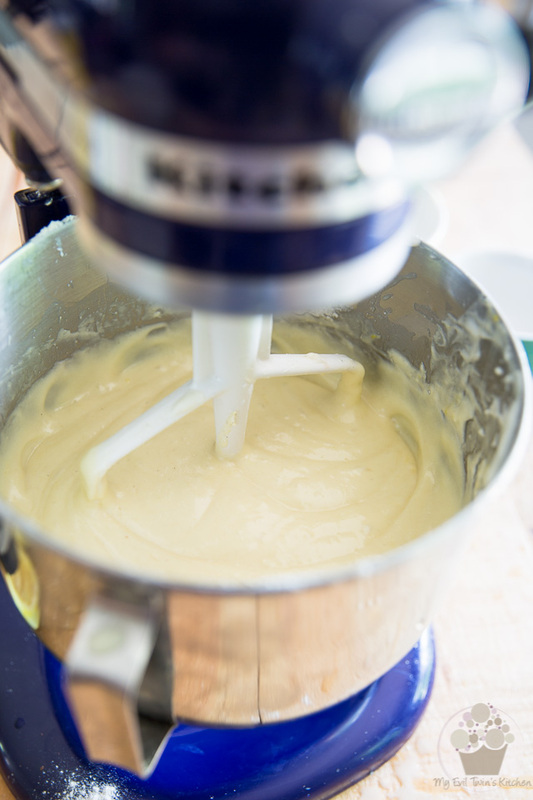 Top the filling with the remaining cake batter and spread delicately to smooth the top. Bake the cake for 50 to 55 minutes, or until a toothpick inserted into the center of the cake comes out clean. 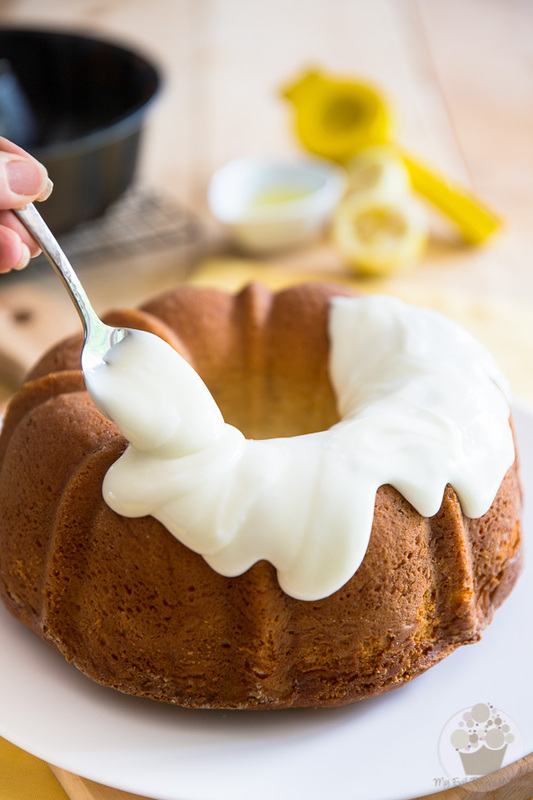 After 30 minutes, cover the cake loosely with aluminium foil to prevent burning. When the cake is ready, remove it from the oven and place it on a cooling rack. Let the cake cool in the pan for 10-15 minutes, then very delicately remove it from the pan and let it cool to room temperature. Transfer the cake to the refrigerator and let it chill completely, about 2 hours. In a small mixing bowl, combine the sour cream and powdered sugar and mix with a fork until well combined. Add the lemon extract (or lemon juice) about 1/4 teaspoon at a time, until the desired consitency is achieved. You're looking for a thick, sticky and semi-pourable icing. 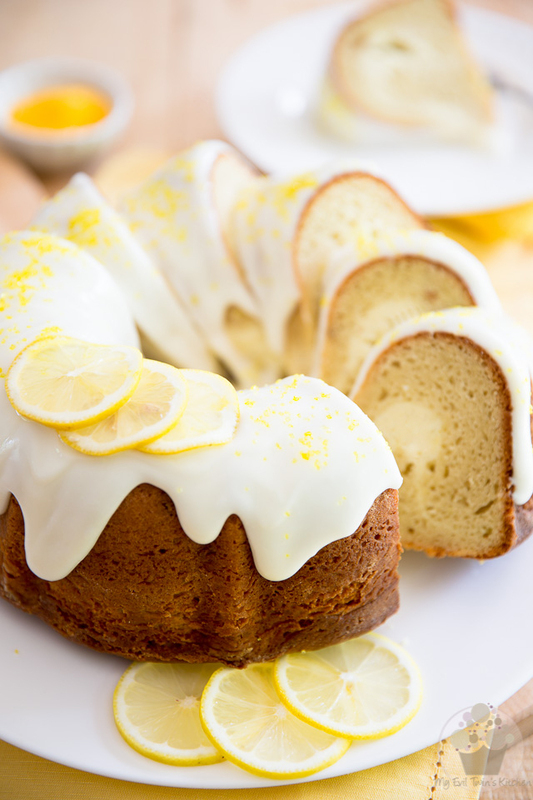 When the cake is completely chilled, spoon the icing over the top of the cake, garnish with slices of lemon and yellow decorating sugar, if desired. Keep this cake in the fridge for up to a week, but serve preferably at room temperature. Hahaha! Sorry about that, Jordan. Or not! Why bother trying to find someone to bake your cake for you? Have you never made your own birthday cake before? 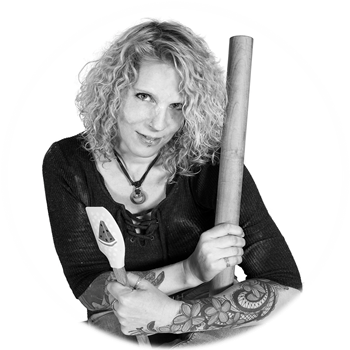 I’m totally for baking my own… after all, half the fun (if not more) is in the making! Now maybe I need to come up with a lemon / chocolate cake? Hmpft… not sure how that would turn out! I’m so very happy to hear that the cake was to your liking, Morgan. Next time maybe try using parchment paper instead of aluminum foil if you find that it sticks to the cake. As for the icing, did you use full fat sour cream? 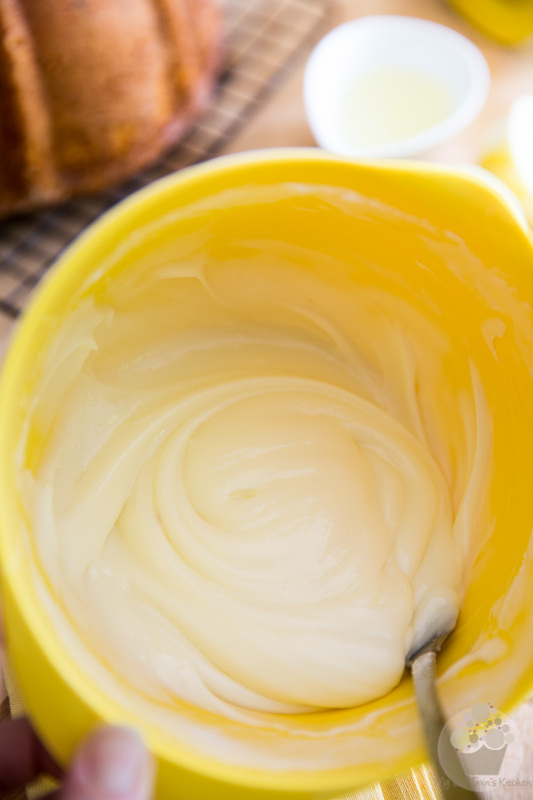 If you used a low fat version, it might explain why it was a bit thin (lower fat versions contain more moisture). That’s a very easy fix, though: just add more powdered sugar until you reach the desired consistency! Hope this helps! May your next attempt be absolutely perfect! With a bounty of Meyer lemons and a soon-to-expire Costco package of Philly cream cheese bricks, this recipe was an ideal use of these ingredients. Lovely flavor and a moist, dense texture with a pleasantly chewy crumb — enjoyed by all. My only disappointment was with the filling, during baking it sank to the bottom of the pan, so when inverted, there was only a thin, u-shaped layer of cream cheese just under the top edge of the cake (as the bottom becomes the top after inverted onto cake plate). It was still tasty, just not as substantial and noticeable as a “filling.” I have to assume this would occur because by batter was on the thinner side, perhaps I let the ingredients get too warm… Any advice to keep the filling suspended in the center of the batter?